Michel Bussi has won plenty of crime fiction awards in his native France but his first book to be translated into English only hit the shelves last year. After the Crash (reviewed here) was a twisted, surprised filled eighteen year investigation into the identity of the survivor of an air crash. 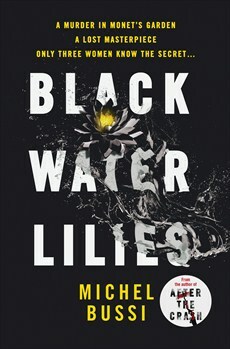 Following the success of that novel in translation, another of Bussi’s crime thrillers, Black Water Lilies, originally published in 2011, has hit the stands. While it shares some of the twisty-turniness of After the Crash, Black Water Lilies is very different and confirms why Bussi might have won all of those awards. Black Water Lilies does not initially feel like a crime novel, with an opening that is more like a fairy tale or some form of mythology. The prologue introduces three female characters. Much like the various aspects of Fate there is the optimistic young girl, the resigned beautiful woman and the all-seeing wise crone. Each is represented as a different personality and each seem to be in their own way, doomed. The action of the novel is very much tied around the actions of these three characters – the young girl with artistic promise surrounded by equally young admirers, the beauty stuck in a loveless marriage looking for an escape and the old woman, feeling invisible and happy to sit back and prod the action forward when she feels it necessary. But this set-up is also full of riddles and puzzles and a foreshadowing which only become deeper as the novel progresses. As the mention of water lilies in the title suggests, there is a strong connection to Monet. The main story opens with the discovery of a local man’s body in the river near Monet’s house in Giverny. There are odd elements to the death including a birthday card for an eleven year-old in the man’s pocket and its similarity to a much older crime. A new police investigator arrives in town and before long there are multiple, seemingly unconnected, lines of investigation and he has fallen for the local school teacher. The inspector starts to lose his way as the teacher’s husband becomes a suspect in the killing and he tries to ignore the fact that she may well be a suspect herself. There is plenty to like about Black Water Lilies. The life and works of Monet and his legacy in the town of Giverny, particularly in the age of global tourism, provide a fascinating context and backdrop for the mystery. Connections to the world of art and art collecting abound and these connections are also explored. The characters of the two investigators are well drawn as are the three women at the centre of the mystery. Black Water Lilies itself is an artful novel. As the mysteries unfold, it appears that it is less a crime novel and more a slow-moving tragedy. There is plenty of foreshadowing of additional deaths as the stories of the three archetypal woman start to converge around that original crime. Like the impressionist paintings it discusses, Black Water Lilies at first looks like one thing but as it pulls back, it is possible to discern that the very different, overlapping individual elements make up a much more complex larger picture. While some readers might find the construction a little too tricky, Bussi manages to surprise and make the reader re-evaluate everything they have read. And it appears that Bussi is really using the crime genre to tell another type of story altogether. He provides a resolution that satisfies as the threads come together but also delivers a solid emotional punch as the tragic elements of the story are laid bare.